Not yet verified, but this story and photograph are chilling. I pray and hope this has not occurred. Youcef Nadarkhani was always a Christian (I believe his parents converted to Christianity) and his Muslim past was that his father was Muslim. 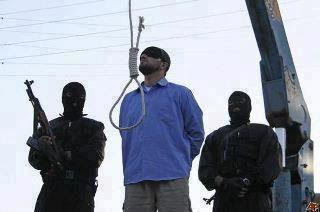 Under this standard Iran could hang Barack Obama for apostasy. And given this "tolerance" by Iranian officials, you wonder why Israel takes Iran's threats seriously. I notice the executioners wearing masks. They don't wish they faces to be known to G-d as they execute one of His own? An argument was made, weakly, in 2008 that Barry's step-father, and Barry's education in Indonesia, made him a muslim in the eyes of Islam. Several muslim news and opinion outlets said as much. They aren't after Barry for apostasy. The Koran permits the faithful to attend Xtian services in order to deceive Xtians. But Muslims always, always go after apostates. Why aren't they after Barry? Because he's not an apostate. Not under sharia. It's truly disgusting that you're taking a religious execution and twisting it to try to impugn Obama. Perhaps Iran isn't trying to execute Obama for apostasy because he's not an Iranian citizen? Hi, I made a petition for Pastor Youcef. Here's the link: http://www.change.org/petitions/iranian-supreme-court-free-youcef-nadarkhani-from-certain-death this isn't a spam post, just a grassroots effort to try and put pressure on the Iranian Supreme Court to free pastor Nadarkhani.